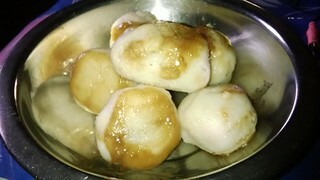 Kozhukutta Unda or Kozhukatta Unda also spelled Kozhakkatta, Kozhukkatta, Kozhukkottaai refers to rice dough filled or stuffed with fresh grated coconut and jaggery. 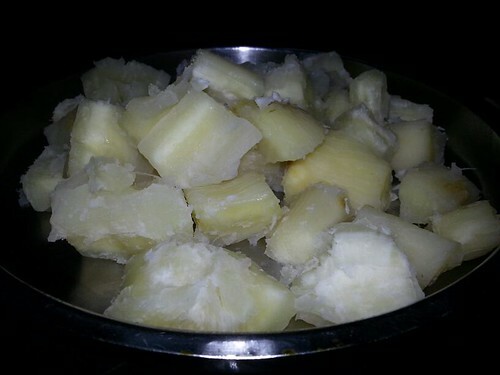 It is one of the favorite Kerala's afternoon or teatime snacks called "Naalu Mani Palaharam". 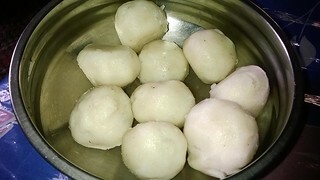 Kozhukatta Unda are rice flour (Ari Podi) balls made from jaggery, grated fresh coconut, ghee , Cardamom powder and a bit of salt. Unda means ball in Malayalam and Rice flour is Ari Podi. 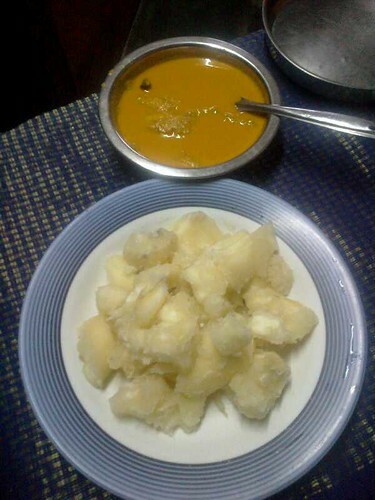 Kachil Puzhungiyathu refers to boiled Greater Yam (Kachil) which is one of the popular traditional food from Kerala, India. Kachil is a bit like Kappa (Cassava) in taste , but while Kappa is always available, Kachil is only available depending on the season. It is serve with a spicy Chammanthi or any kind of Curry and great during winter or cold months. This Kachil Puzhungiyathu picture below was one of the foods sold during Annual Food Festival in Allepey Beach in Kerala in 2013. Annual Food Festival in Allepey in being held during the Christmas Season when many foreign and local tourist visit Allepey. It is participated by the local Restaurants. Kaari is the Malayalam word for Cat Fish or Catfish. 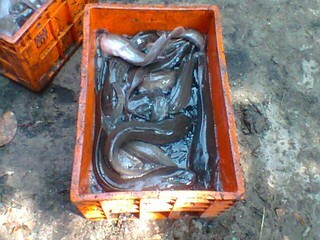 Catfish or Cat fish is also referred to in various Malayalam names, such as Silurus or Mushi-Silurus, Valia Etta and Thendu Kadu. 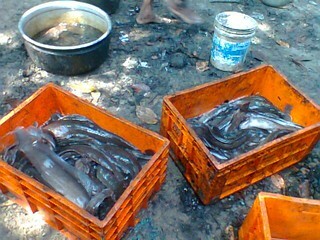 Here below are pictures of Kaari caught from one of the rivers in Allepey, Kerala, India by the locals. 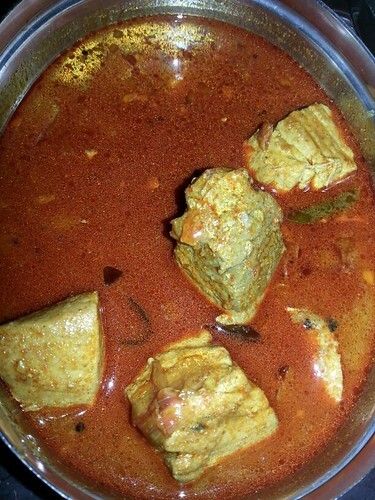 In Kerala, they make mostly Meen Curry (Fish Curry) from any variety of fish that landed their kitchen. Kodampuli refers to a fruit from Kerala, India which is used as souring agent as substitute for tamarind , especially for making Meen Curry. This is considered to be a magical fruit that transforms every South Indian dish delicious. It is one of the important ingredient present in South Indian pantry. 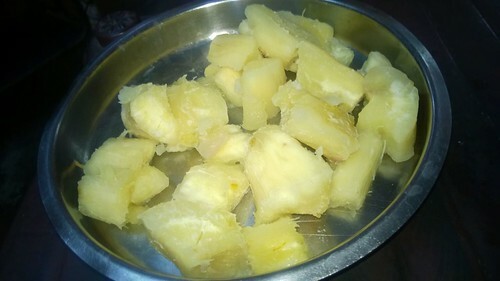 Kappa Puzhungiyathu refers to boiled or steamed cassava which is called Kappa or Kappioka in Malayalam, the language in Kerala, India. Kappa is one of the staple food in Kerala, India. They are cooked in varieties of way and one of them is by boiling or steaming then served with Chutneys or Curriesas a substitute for rice, paricularly for breakfast. 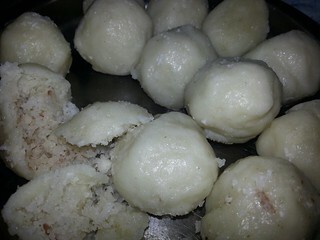 Kappa Puzhungiyathu can also be served with sugar and newly grated coconut for those who prefer sweet breakfast. Kappa is called Kamoteng Kahoy in the Philippines. 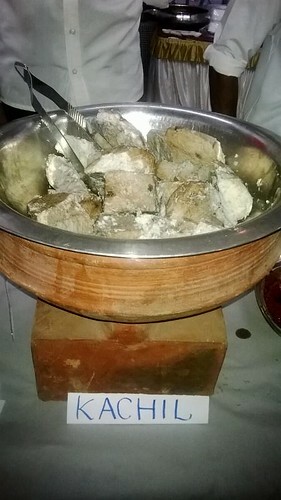 Boiled Cassava is called Nilagang Kamoteng Kahoy. 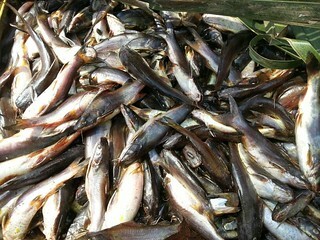 Kappa is prepared by removing the thick skin, then sliced into bite size pieces before steaming or boiling. In the Philippines, we just boil Cassava (Kamoteng Kahoy) then served ith sugar as a dip or sometimes margarine or butter and sugar. We never eat boiled Cassava with savory sauces .